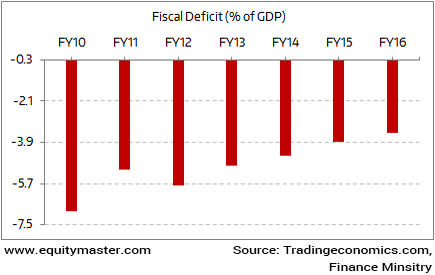 Home > Economic > India Fiscal Deficit target of 3% of GDP..
India Fiscal Deficit target of 3% of GDP..! One of the important yardstick to measure the financial health of an economy is Fiscal deficit. It is the difference between the government revenues and expenditure. The difference is generally bridged by debt. The present government is committed to reduce the gap. The long term fiscal deficit target is 3% of the Gross domestic product (GDP). This simply means relatively less expenditure. Hence, less government spending. In last one decade India is making serious efforts to reduce the fiscal deficit level. Ever since, the new government came in it has been in favor of fiscal consolidation and meet the long term fiscal deficit target of 3% by FY17-18. Mind you, the recent demonetisation has resulted in a slowdown. Further, government has announced flurry of projects but execution is still pending. This means the government needs to relax its spending to spurt the growth again. This means, once again, the government needs to fight dual challenge. First, maintaining its stance on fiscal consolidation and sticking it fiscal deficit target of 3% of GDP for FY17-18. Second, it must relax the deficit target for reviving the economy from the shock of demonetisation. With elections in Uttar Pradesh and preparing the ground work for 2019 election it would be interesting to see what stance government takes Fiscal consolidation or Fiscal deficit.